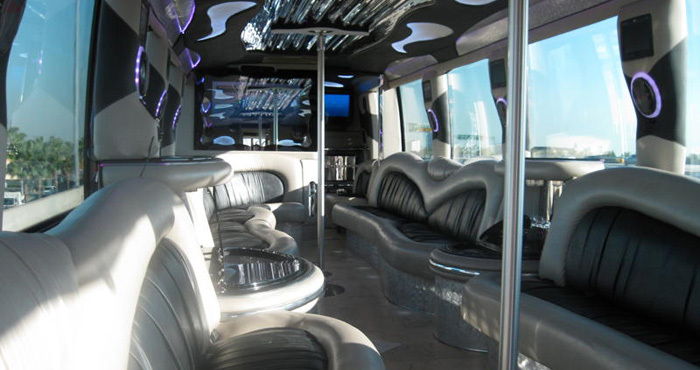 Looking to rent a party bus in Irvine? Irvine, California is much more than a College Town—even though a dozen colleges and universities call it home. It’s a vibrant, multicultural city with food and beverage festivals, world class venues for concerts and fashion shows, and a great place to build an exceptional night on the town. 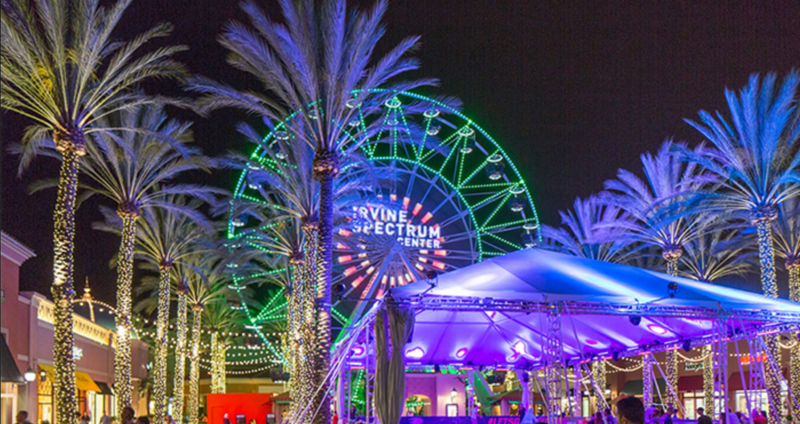 Whether you live here or not, exploring Irvine is something everyone should do at least once. 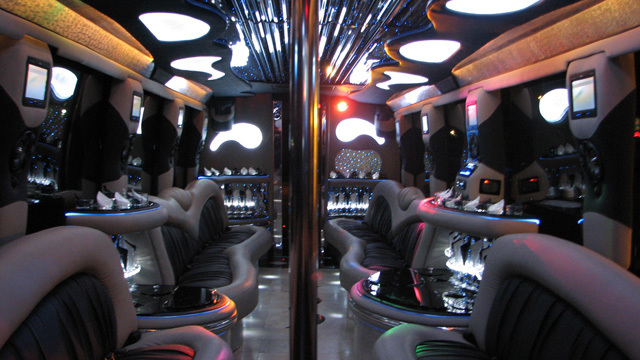 And, a party bus in Irvine is a great way to shuttle you and up to 44* of your friends right into the heart of the action. Ride in comfort and style with plush interiors, complimentary beverages (adult and otherwise), a state-of-the-art sound system, flat screens, and more. Plus our professional drivers take all the worry out of navigation, parking, and traffic—just relax and enjoy the ride. So what’s to do in Irvine? This is a great family-friendly event in Irvine designed to celebrate diversity among the citizens of Irvine and Orange County. In the 150+ tents and vendor stalls you’ll find local merchants, live entertainment, and foods from around the world. You and yours can spend the day in this shaded park and just enjoy everything the festival has to offer. And our party buses in Irvine make getting everyone to and from the festival a snap. Planning a special day with your girlfriends or maybe an adult outing for friends and family? The Great Wine Festival is a wonderful day in the park with some of the best wine, beer, and spirits in California. Each May this 7-year-old wine festival in Irvine brings over 30 of California’s most exceptional wineries, breweries, and restaurants to Orange County Great Park in Irvine. The festival features unlimited tastings, live entertainment, and more to the first great metropolitan park of the 21st century. Plus proceeds benefit the Legal Aid Society of Orange County—sip and savor for a good cause! This Red Carpet event is one of the best opportunities for fans and individuals in the film industry to meet and mingle. Plus there are over $25,000 in prizes offered as awards to outstanding filmmakers, actors, and industry legends. The festival also sponsors awards in little-known categories like Best Webisode, Best College/University Short, and Best Short Narrative (Sci-Fi). If you and your friends are into fashion, you don’t have to fly to Italy or Spain to get your kicks. 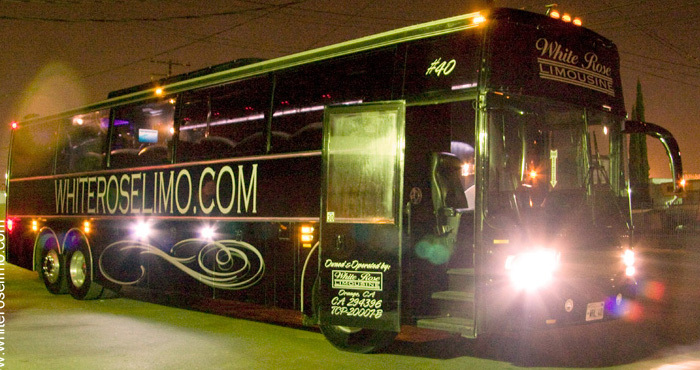 Rent one of White Rose’s party buses in Irvine and make your way to Style Week OC. 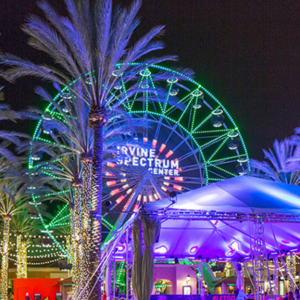 This two-week festival brings all the glitz and glamour of a European fashion week to the Irvine Spectrum Center. With the launches of several new lines, celebrity guests, and gorgeous models Style Week OC is a wonderful way to break away from the everyday. This world class venue has hosted concerts from rap stars like G-Eazy to country legends like The Dixie Chicks. In fact, this year alone, Irvine Meadows brought Rob Zombie, Miranda Lambert, Florida Georgia Line, Weezer, Panic at the Disco, and Snoop Dogg to Irvine. 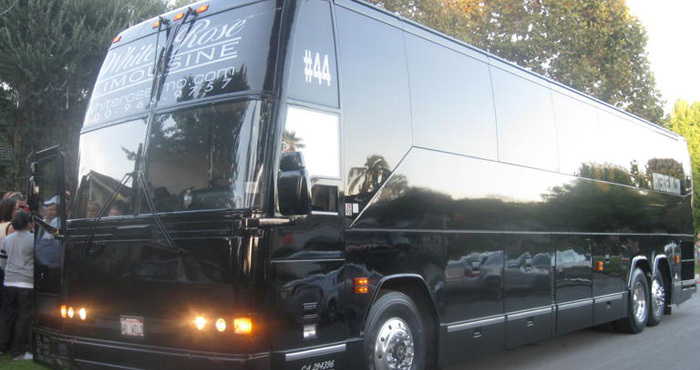 And if you’re attending a concert at Irvine Meadows, there’s no better way to get to and from the venue than a ride in our party buses in Irvine. 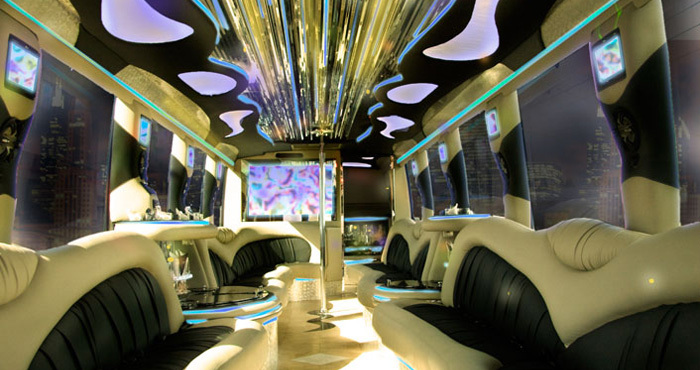 These stylish machines can hold up to 40 people and feature luxury amenities like leather seats, a complimentary cocktail bar, excellent sound systems, and professional drivers. Don’t ruin your concert experience by getting stuck in traffic, lost in the parking lot, or worse. This isn’t your typical karaoke bar. Grab a group of friends for a night out or make your bachelorette party unforgettable at Plush. With 16 private karaoke rooms—like you’ve seen in movies like Lost in Translation—you get a VIP experience at an affordable price. 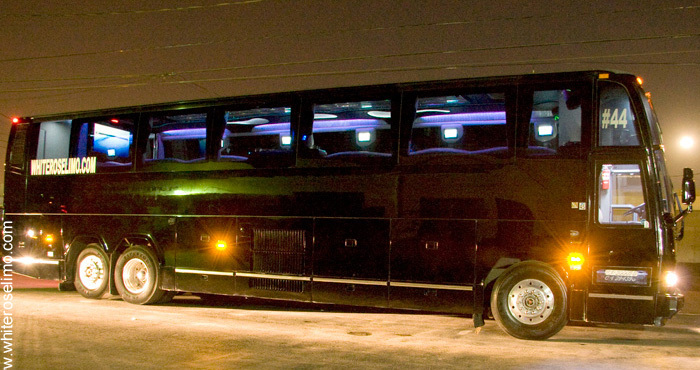 Hire a party bus in Irvine and you can enjoy complimentary beverages before and after your personal concert as well as curbside pickup and drop off for safe travels without the need of a designated driver. Happy hour inside a Whole Foods? The Irv is a wonderful brewpub inside the Whole Foods Market in Irvine. With happy hour specials like $7 drafts and goodies like the vegan burger on the menu this is a great place to grab a bite and beer even if you’re not grocery shopping. Make The Irv your first stop before heading out on the town and grab some snacks for the road while you’re there. This kitschy little Mexican restaurant/pub offer authentic food and excellent cocktails. The Margaritas (with flavors like cucumber and mango) are exceptional, as are the nachos and guacamole. Javier’s is a wonderful place to begin a night out or end an early one with friends.